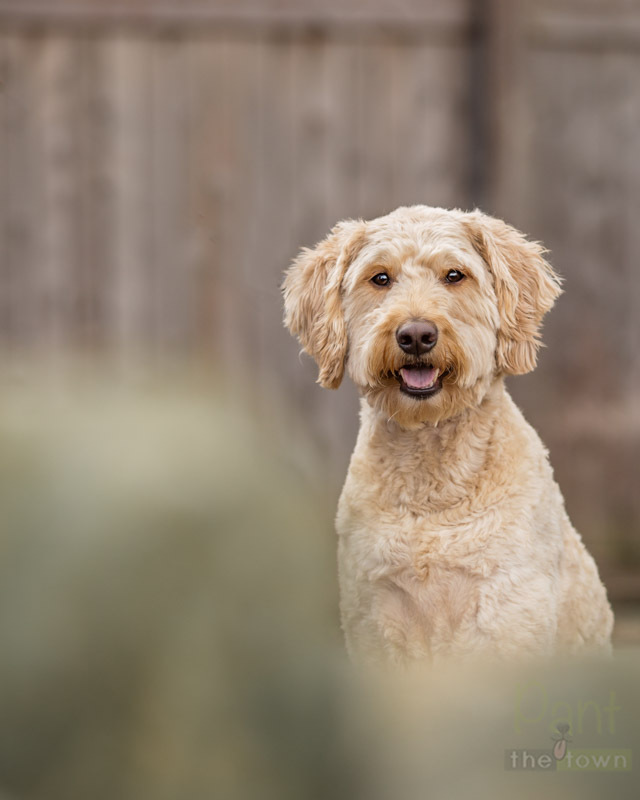 Welcome to week 48 of our Pet Photography Blog Circle! I can’t believe December is right around the corner 🙂 In this week’s topic we are “Getting Low”. 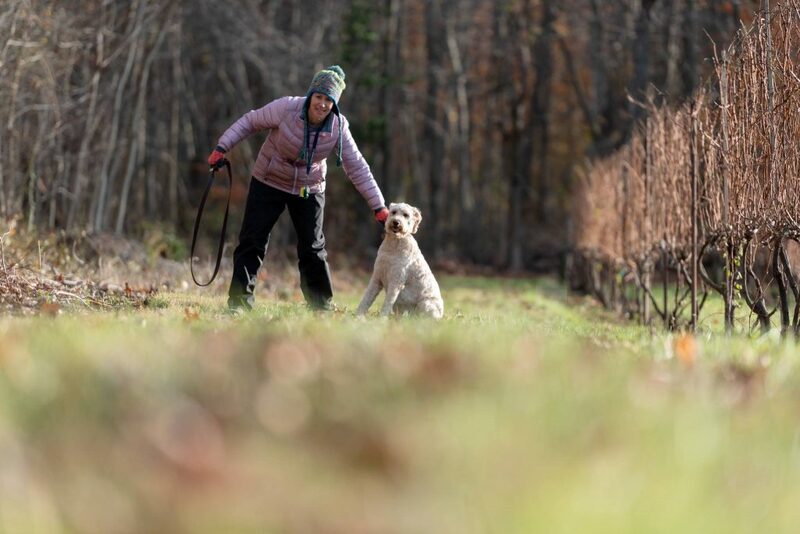 I thought this would be a perfect time to talk about my recent meet-up with another northeast pet photographer, Alessandra Sawick of Alessandra Sawick Photography . Alessandra and I met several years ago “on line” through Jill Flynn‘s Pet Photography course (wonderful class!). 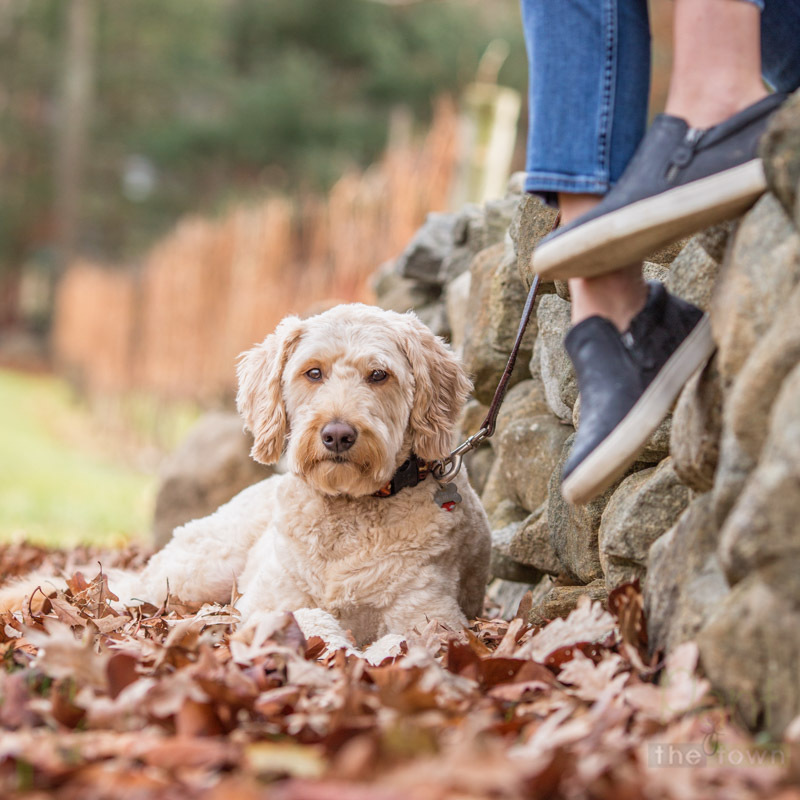 We kept in touch over the years and recently thought it would be fun to pick a location halfway between us and photograph a dog while we are at it 🙂 Why not a vineyard? Wine and dogs?! I googled “Dog Friendly Vineyards in CT” and Chamard Vineyards in Clinton, CT, was open to our request and super excited!!! I am north of Boston in MA, and Alessandra is in NJ – perfect! We met on a Wednesday mid afternoon. It was a bitter cold day (20’s) with whipping wind. It sure felt below zero! We were all bundled up! I even had my Halle Hansen waterproof pants on as an extra layer since the ground was raw and I’d be getting “low”! Here is a fun image Alessandra took – we helped each other “wrangle”!!! This is me holding Doodle Dog Rigby right before his mom called him – they were super attached! We photographed two amazing dogs! First was the vineyard manager’s dog, Rigby. He was an energetic doodle! He loved to run and he loved to be right next to mom! I spend most of my sessions lying down on the ground on my stomach…. and as i get older, it takes me a longer to get back up haha! As you can see from this image, i was down very low since Rigby’s mom’s feet were dangling above. Getting down on the ground gives the perspective of seeing things at the dog’s level. Next up during the best time of the day for light known as “golden hour”, we had handsome Flint! 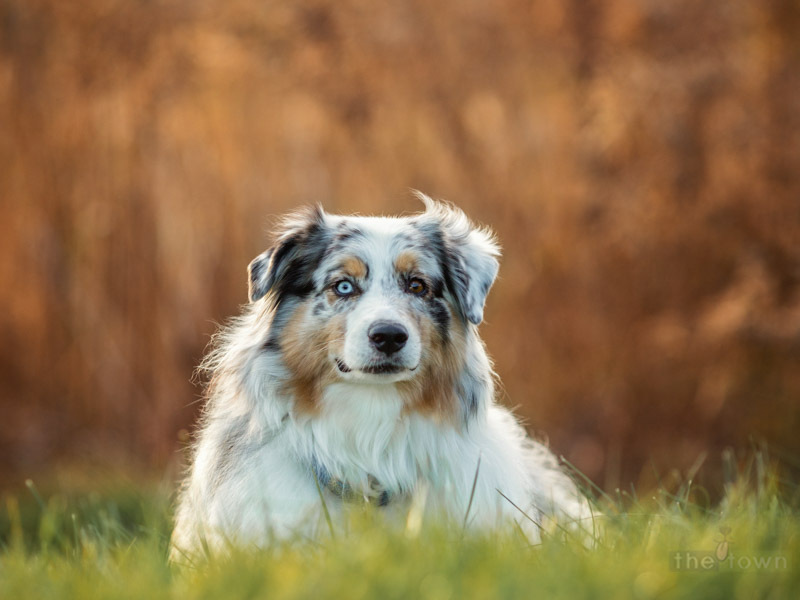 He’s a gorgeous Australian Shepherd and he did amazing! This next image was take very low, to get eye level with Flint and get a few of the leaves “blurred” in the foreground. The next image is one of my favorites of the afternoon – being low to the ground with Flint and looking into those gorgeous eyes of his! Aren’t they beautiful? After our photos, Alessandra and I enjoyed a fantastic dinner at the winery’s Bistro and a bottle of white wine – a great ending to the day! If you are in Southern CT, definitely stop by for a wine tasting and enjoy the beautiful grounds. Thanks for stopping by! 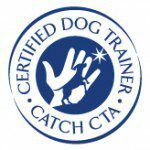 This is a blog circle and you can follow along to see some amazing work from pet photographer’s around the world. 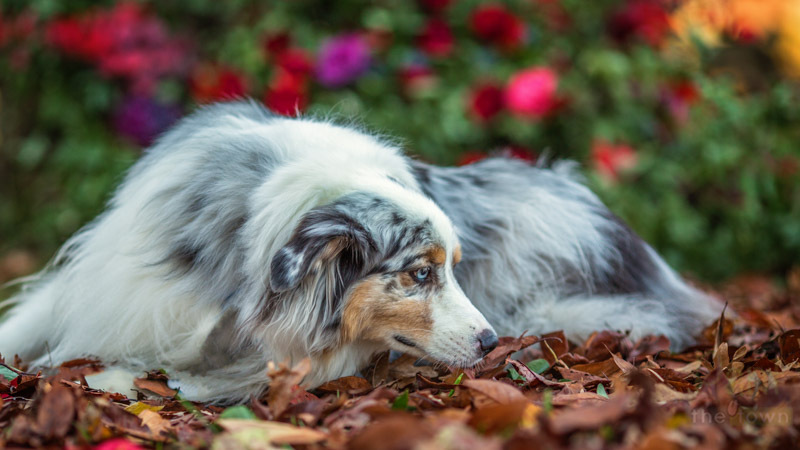 Next up is Pawparazzi Pet and Animal Photography presented by Shae Pepper Photography. Have a wonderful weekend! Greats shots. The Winery looks like a great place to shoot photos. The last photo of Flint is my favorite. Colors are perfect. I know the older you get the harder it is to get up from being down low, especially in cold weather. Great shots down low. Both dogs look awesome, but I love those shepherd eyes! Cool idea to meet halfway….what a fun thing to do! Thank you Lynda! Yes, those eyes were stunning! Meet ups are fun! Thanks, Pete! It was such a fun day!!! That’s it. I’m Googling “dog-friendly” vineyards near me. I love that landscape and I’ve so many terrific images you’ve taken in and around them it makes me jealous! Yes, Tracy! I LOVE doing photos in wineries! Bright and early and the grounds are beautiful no matter what time of year! Thank you so much!